C and D began care with me at 29 weeks along in their second pregnancy, after many. many weeks of emailing back and forth. C was desiring a VBAC, and spent many weeks weighing the options. C’s first labor and birth had been quite a journey that ended in a cesarean. C and D wanted something better for this journey. C’s pregnancy progressed beautifully. The day before her estimated due date, C text me that she was feeling off. Contractions were spaced, but became more regular that evening, come every 7 minutes. We talked about eating and drinking and trying to ignore the surges while it was early. That evening C took tylenol pm to sleep, and was able to get some rest for the labor journey that awaited her. August 2nd I touch base with C around 730 in the morning. Contractions were still coming every 5-7 minutes apart, and much more uncomfortable. We made plans for C to come see me around 1230 that afternoon in order to do an assessment. I watched C and D pull in to my house and could tell the contractions were uncomfortable. C bounced on the birth ball in my office while we talked through things. Contractions were coming every 3-5 minutes, lasting a minute long. Mom and baby’s vitals were perfect. I did a cervical check and found C to be 5cm dilated, 80% effaced and baby at a -1 station. I did a sweep with C’s consent. I estimated baby to be around 7.5# (boy was I wrong!!). I encouraged C and D to get some lunch and to go home and prepare for a baby. At 2pm, C stated the contractions felt different. By 630 that evening, C was ready for us to come. The birth team and I walked in right before 8pm, finding C contracting every 3 minutes, lasting 60 seconds. A cervical exam found great change over a few hours. C was 7cm dilated, 100% effaced and baby engaged at a 0 station. C was very encouraged with how things were progressing, and mentioned multiple times that this labor was so different from her last. We got the birth pool filling. C got in the pool around 840 and continued to labor. C labored so beautifully. I don’t know if there is anything more gorgeous than a woman in labor. In between surges, C was chatty and laughing, but every 3 minutes for well over a minute, things became serious and C breathed and focused to get through the surge. About an hour passed. C decided to get out of the birth pool for the restroom, and asked to be checked. She was now 8cm dilated. C was happy with the news, and got back into the birth pool. Around 10:20, C stated she was feeling a little pushy at the peak of contractions. She labored in such an instinctual way. Moving as her body told her. Big brother came home and gave mom a “cheez it” kiss. <3 Around 11pm, C got out of the pool to walk and use the restroom. We did a check and found C to be 9cm dilated, 100% effaced and +1 station. During a check, baby pushed through the cervix. I discussed with C that we could try pushing for a bit if she was feeling it was time. C quickly got back into the birth pool, and began to push with the next contraction. Within minutes, C had a tiny anterior lip, and baby was sitting at a +2 station. At 11:30pm, C moved into hands and knees in the pool. She was completely dilated and effaced, with a very bulgy bag of water. Contractions spaced to every 5 minutes, allowing C to get rest in between surges. As midnight came, C decided she would like me to break her water. I broke her bag and C moved into semi reclining to continue pushing. C continued to rotate positions every 15-20 minutes, moving from semi reclining to hands and knees to side lying. At 12:40 am, a small amount of baby’s head was visible on the perineum. I encouraged mom to try pushing in the semi reclining to see if it would help baby move under the pubic bone. A little after 1am, I encouraged C to get in an assisted squat, with D helping hold her up. That was the position that she needed. 1:26 baby was crowning, followed by the head at 1:28am. Sweet baby was born earth side at 1:29am. THAT moment! I absolutely love this moment of such joy and victory. I will never forget C saying over and over and over, “I did it. I did it.” We got mom and baby to the bed, and baby latched like a champ. Once it was ready, I did the newborn assessment. I was shocked at the scale! My estimate of 7.5# was definitely WAY off. This sweet little guy was a whopping 9.4#! I love how my VBAC mamas tend to have larger babies. I think it is God’s way of saying not only can you do it, but you can do it with a baby this big! Love it. Welcome to the world sweet Charles Elliot, born on August 3, 2014 at 1:29am, weighing in at 9.4#, 21″ long. Your mom rocked it! 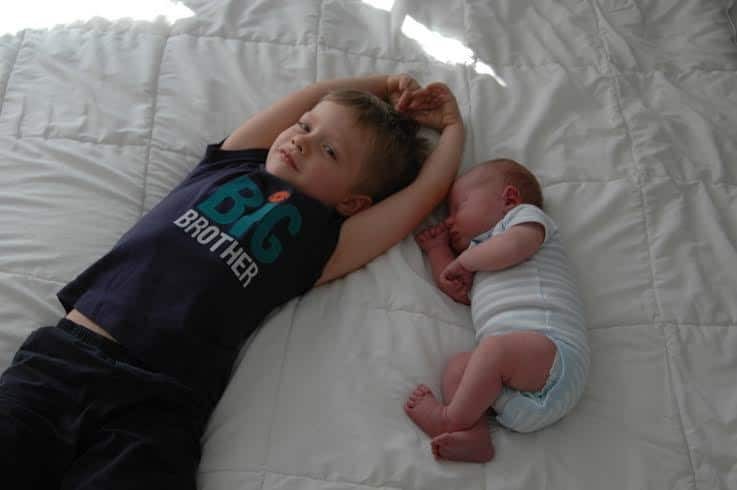 Little guy is so loved by his big brother!